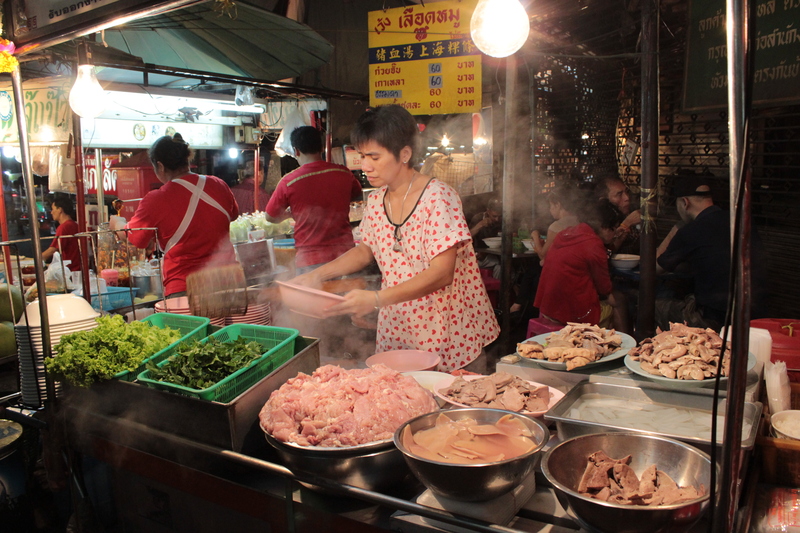 This is what a Sunday looks like when you’re an avid eater in Bangkok. Parental supervision advised. Do not try this at home. As Giada de Laurentiis would say, “I eat a little of everything and not a lot of anything.” Perhaps she thinks she sounds wise, but perhaps she’s never eaten Thai food. You can’t just nibble Thai food. The flavors are too big and bold to just let them sit there sadly on the plate like limp pizza. 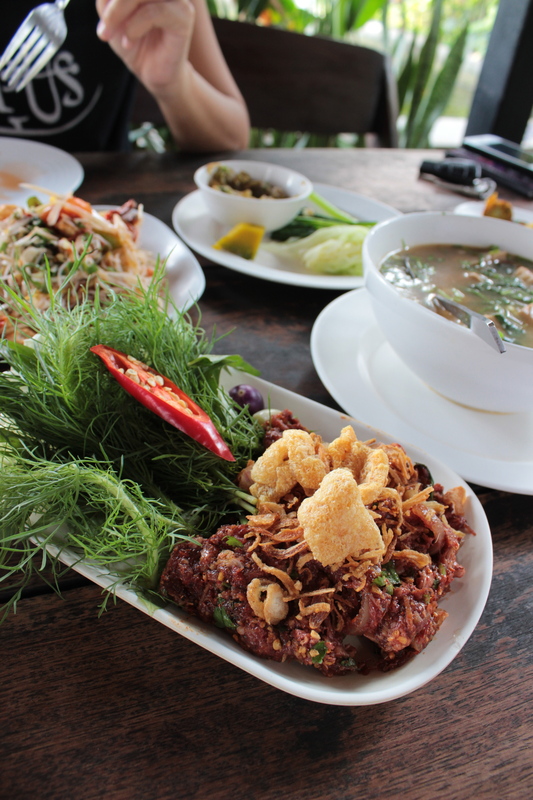 Thai food demands you to take notice and eat it. The fire is too hot and if you stop eating, you’ll have trouble breathing (sometimes). So the only option is to keep eating. And keep eating is what we did all day yesterday. 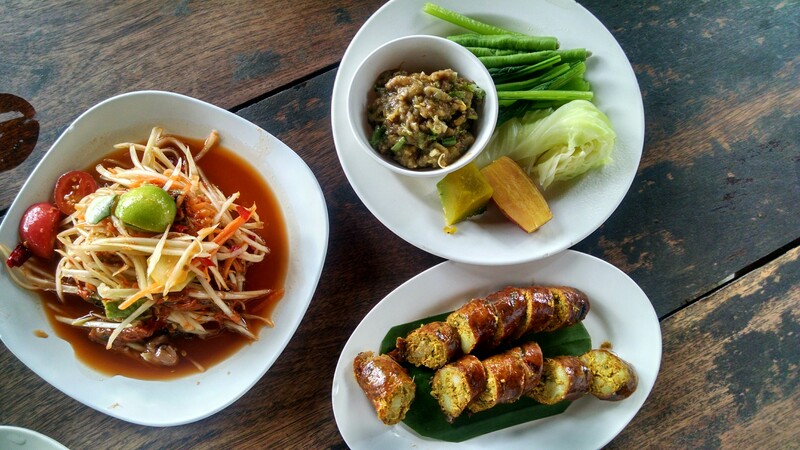 We started off our lunch with some of our favorites: som tam with red mussels, pla ra (fermented fish) relish with steamed veggies, and sai ua, an herb-ed packed sausage. This fine young man took care of all things grilled. 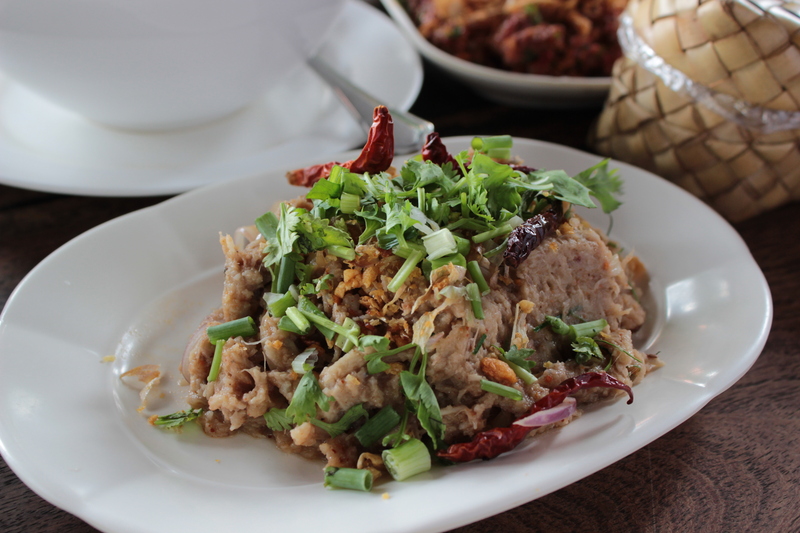 Som tam pa, or jungle papaya salad. Jackfruit relish. Mushroom relish with steamed and fresh vegetables. 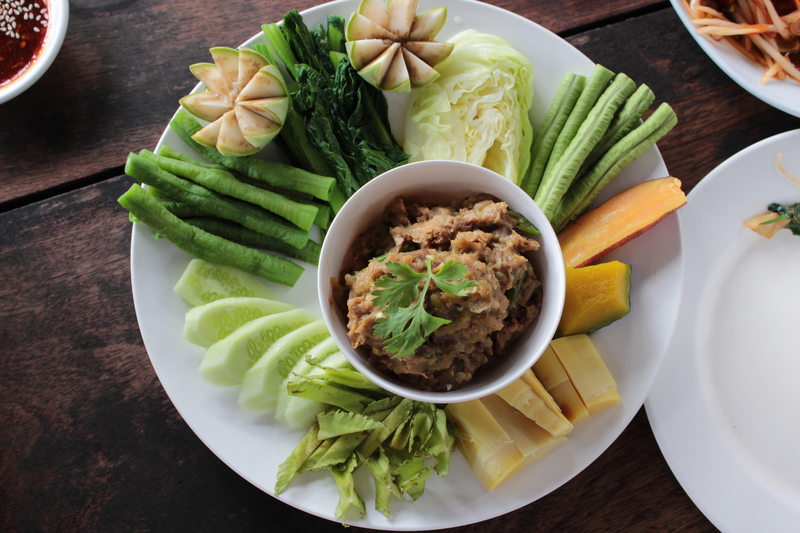 Raw beef laap. 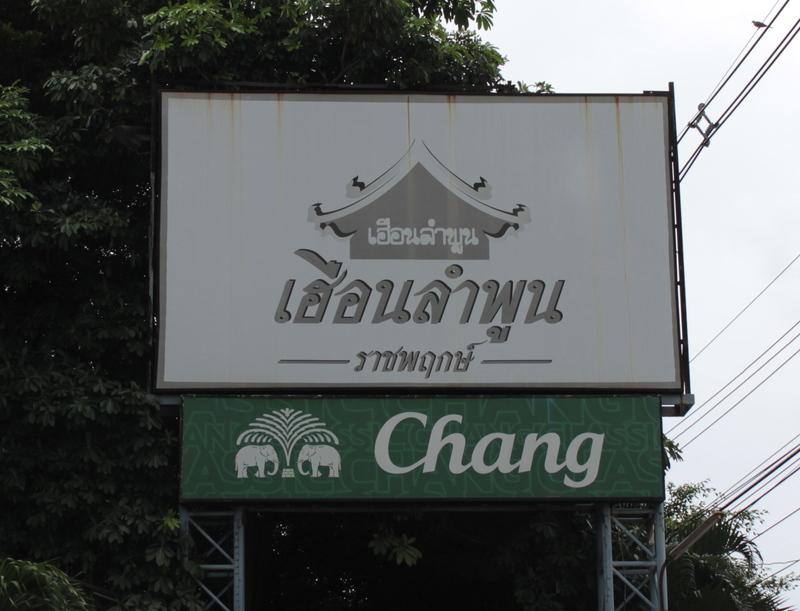 The name of the Northern style restaurant. 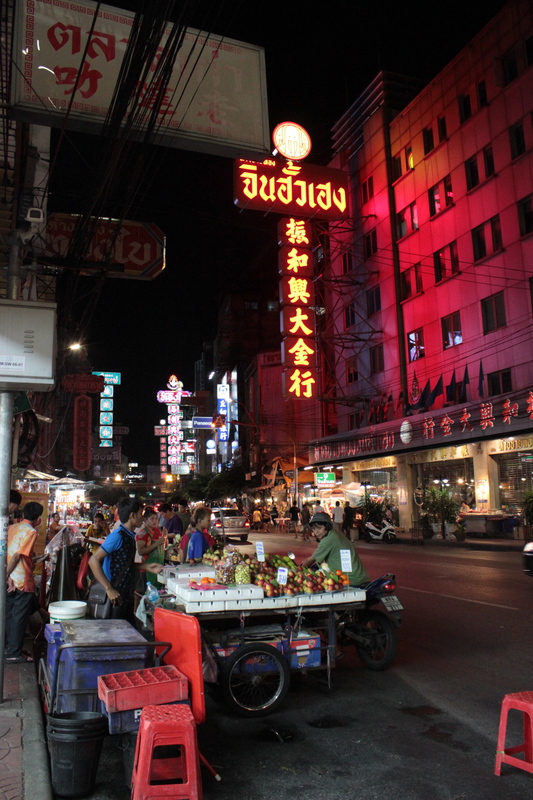 And then we went to Chinatown’s Yaowarant road. Nhoi wanted to take me for kuay jap, and honestly, I wasn’t that excited. I didn’t want to be rude, and I trust her taste judgement, so I went along with the suggestion. I had been taken once before for this soup and thought it only mildly interesting. But Nhoi stated it was one of her favorites, so I imagined there had to be some value to it. We sat down at a table that was only feet away from the busy traffic and ordered a couple of bowls. I dipped my spoon in to the clear broth and upon first sip, knew this was worth eating. 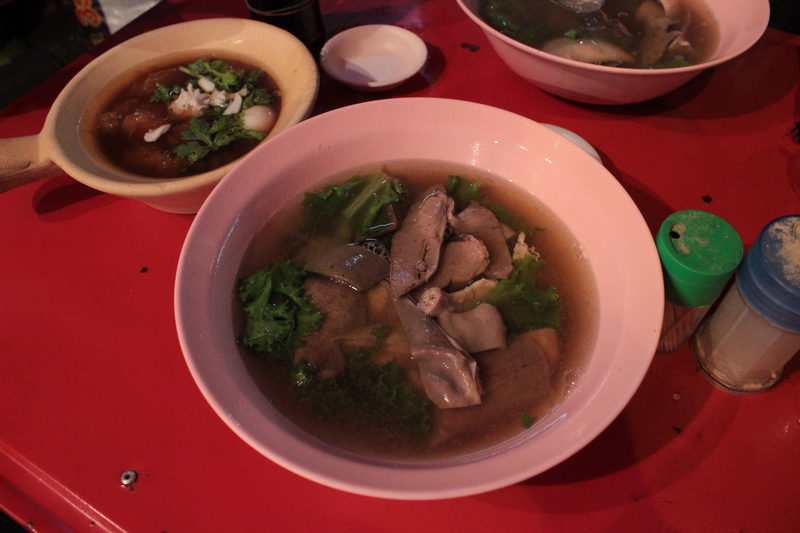 Kuay jap is a porky filled soup filled with intestines, liver, tongue and kidney and topped off with lots of white pepper. It was so fantastic that instead of sharing, like we had planned, we each had our own bowl! 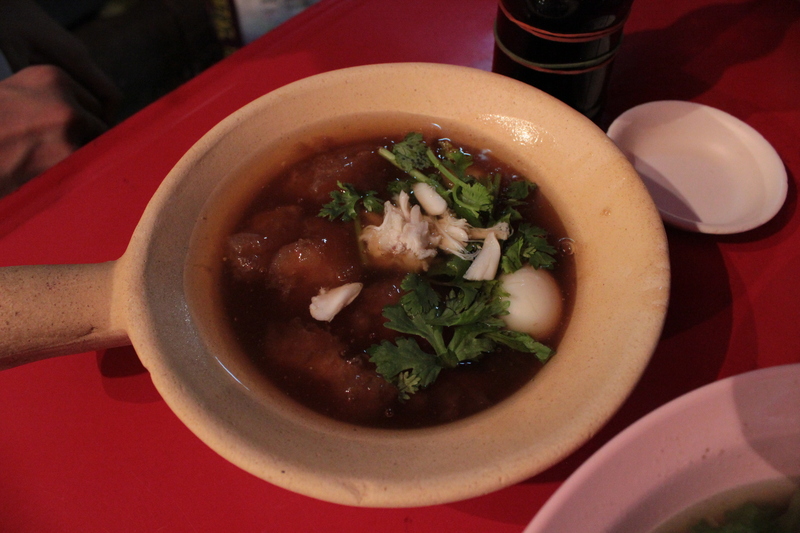 The other vendor right next to our table was selling gelatinous fish maw soup, so we had one of those too. After many brothy, savory things, we moved on to dessert. 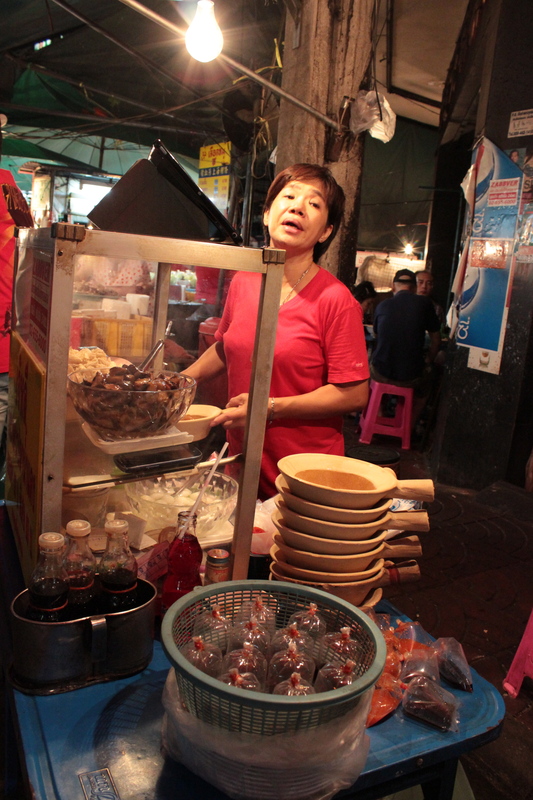 We had khanom buang, both the sweet and savory versions. 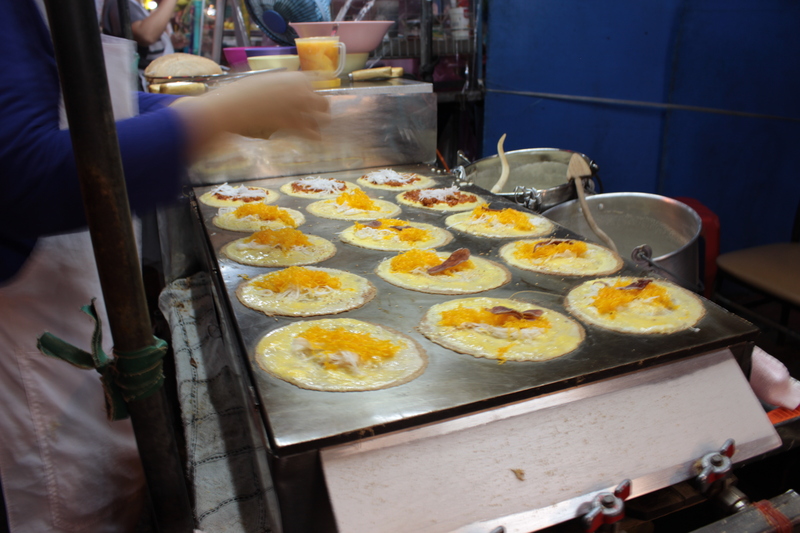 The batter is smoked with an incense candle, which makes the crispy taco-like shell headily fragrant. It was the perfect note to end on. Except we didn’t end there! 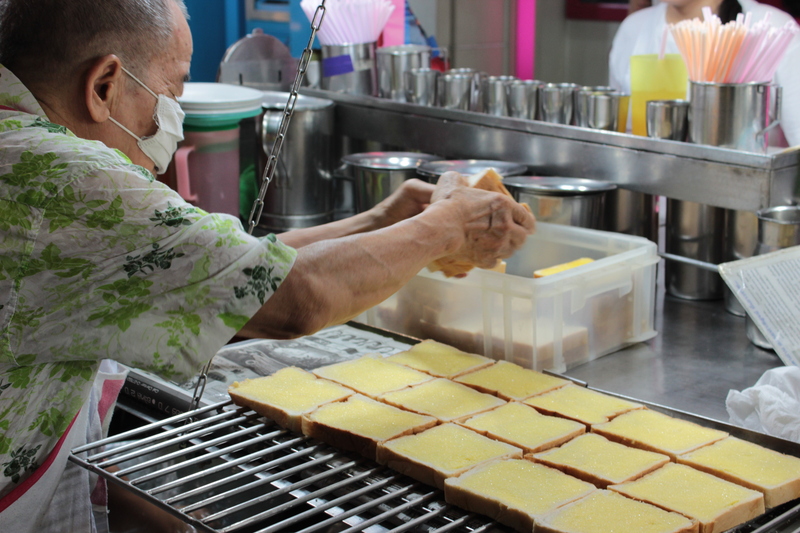 We tracked down a well known stall that makes the simple yet wildly popular dessert of toasted white bread with coconut custard. This young man, pictured below, slathers white bread with margarine. It’s then toasted until it’s crunchy on the outside yet doughy soft on the inside. It’s then slathered in your choice of topping. This dessert is warm, crunchy, soft, and when you squeeze it, it oozes your choice of sweet eggy custard. What’s not to like? 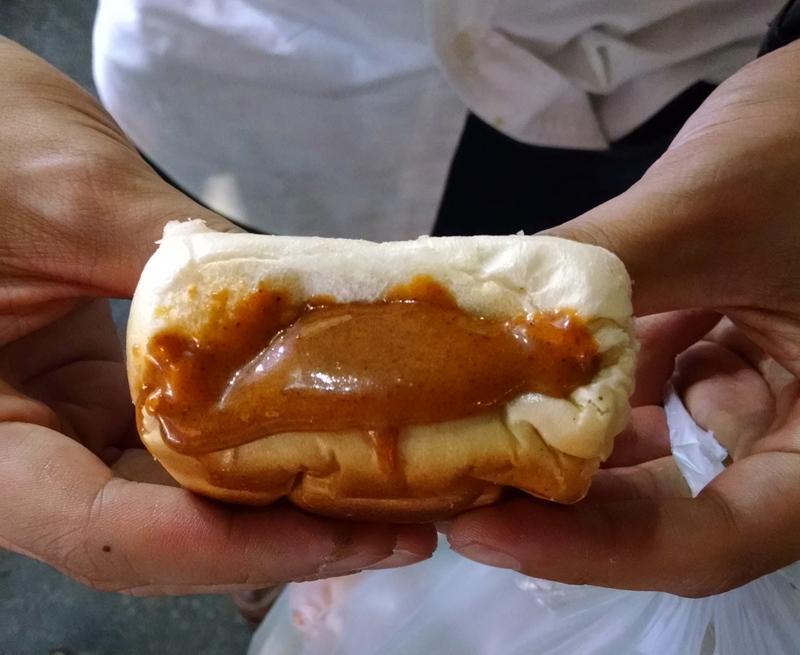 Our favorite was the chili jam custard. A day on the town with Nhoi and Tapooh may result in a some tighter fitting pants, but the zings and zips that happen in your mouth along the way make up for it! Previous Post Duck, Duck, Duck….Duck! Can I make a friend with you!